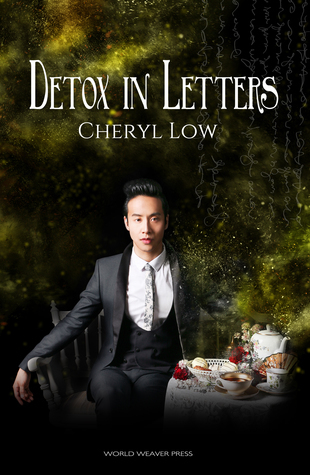 Detox in Letters is book two in the Crown and Ash series by Cheryl Low. If you haven’t ready book 1, Vanity in Dust, I highly recommend you get started. This series is so delicious and different from other books that I’ve read. It is set in a completely new fantasy world in which the royal family and wealthy live in the High of the Realm. In the center of the Realm sits the tower where the Queen lives with the city situated in rings around her; the High, Middle, and Low. The wealthy spend their days indulging themselves in a drug called Dust. Everything seems lush and lovely. The wealthy seem like indulgent brats, just doing what they want regardless of anyone’s feelings. However, as the story goes on, you start to see there is darkness beneath the beauty of this world. Not everything is as it seems. What happens when the Dust wears off and the people start to see the cracks in the beautiful veneer laid before them? Vaun Drey Fen is the prince and main character and I love him! He can be ruthless, but man do I ever love a good “grey” area character. Book 2 picks up a few years after the end of book 1. I don’t want to say too much and spoil anything, but if you like fantasy and you’re looking for something a bit different, definitely pick this one up! Cheryl Low does such an amazing job of revealing things slowly and keeping the reader guessing about what all this world has to offer. I really enjoyed this sequel. We get some answers and more questions and I cannot wait for book #3! Thank you so much to Cheryl Low and Word Weaver Press for sending me a copy of this book!